I was caught in the mid of greater Thal desert at 4am in the morning. There were sand dooms and nothing else. The bus went out of order and no solution left to reach the nearest locality from where I could catch the bus and reach home far away from here. Then came Google Maps on my cell phone. And finally I was aable to come out of this barren desert where no water, human beings, and other life symbols. Google maps launched many years before, but the mobile application was launced in 2006. 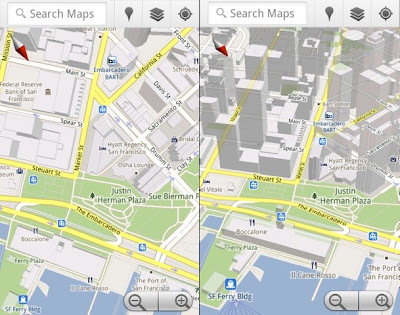 It was just a java app but in 2007, a GPS like location app was released named Google Maps for mobile 2.0 but it did not require the GPS reciever. Since then, Google Maps has become one of the most useful location determining service for cell phones all over the world. The history and diversity of Google maps can be found here. The new 3D imaging in google maps. Excellent search capabilities - very intuitive! Maps include parks, airports, hospitals, malls, and other points of interest. Aerial photos and traffic information are great additional features. The site has problems understanding that you want to see a new region. Sometimes ZIP Codes are needed to make the site understand. If some one wants to download it on cell phone, he/she must visit this link : Google Maps for Mobile Phones. You will have to enter your cell phone operating platform and then google would sms you the downloading link. You can directly download as well. Just google "Google apps for mobile" and will get the list of apps for mobile phone users from Google.Or visit this link i.e. Google Mobile. With the induction of location addition, location images, and now the latest one is 3D imades for certain locations make this app something special to be used by every cell phone user. This is the most important app one should have in his cell phone. Thanks a lot Google. Yes, this is much better than map to ground and ground to map exercises I remember. They were so old fashioned.